Hi my loves! It's now been nearly two weeks since Coachella but I'm still not over it. I'll admit, while there I felt overwhelmed and exhausted most of the time but looking back at my experience, I had a whole lot of fun, too! Sure you're constantly running from one place to the next, changing outfits every two hours and capturing content every waking second of every day (in the words of my friend Justin: The Influencer Olympics) - but in the end, you're also enjoying some of the world's top musical talent, partying in the desert and kicking it with friends. Indulging in an ice cream cone or two. 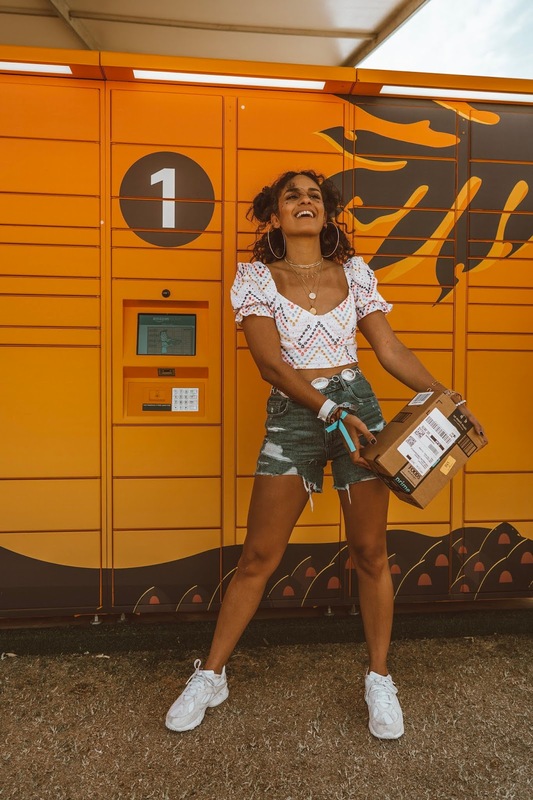 Coachella: Here’s How to Get All of Your Essentials Shipped to the Festival! Hello from NYC after nearly half a month of traveling! I’ve been non-stop go go go since the beginning of April and it feels so nice to finally be home. 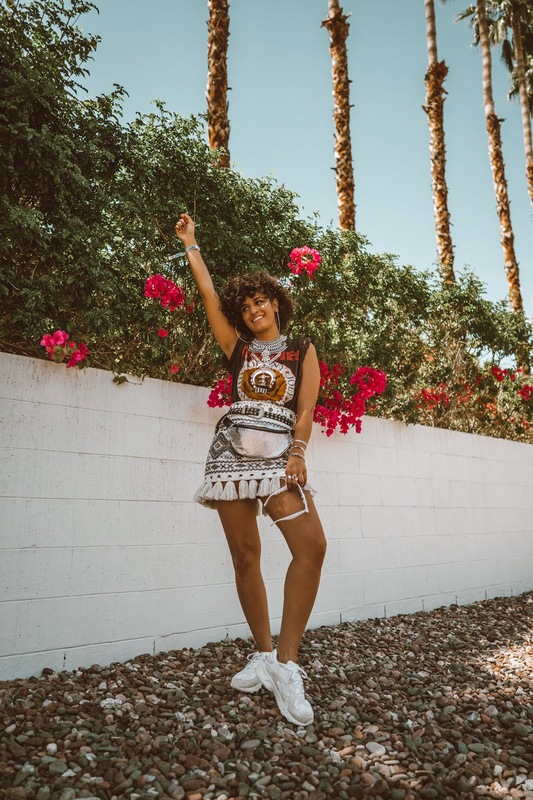 Just this past weekend, I attended my very first Coachella festival and it was quite the experience! I danced, I laughed, I hung out with old friends and made new ones and, of course, I did what I love most which is capture content for you guys! 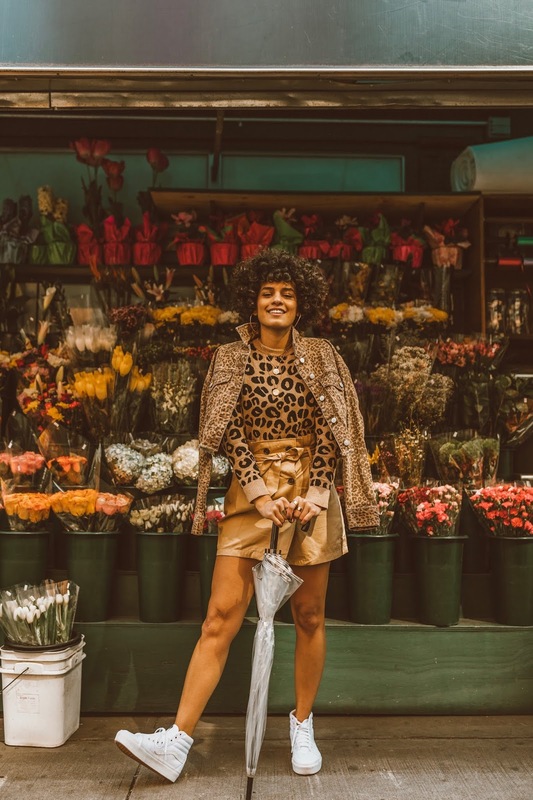 The only thing that made Coachella tricky for me was that I was coming almost directly from Hawaii...I only had a day in New York to switch my bags and head back west. So inevitably, some essentials were left behind like my Polaroid film! 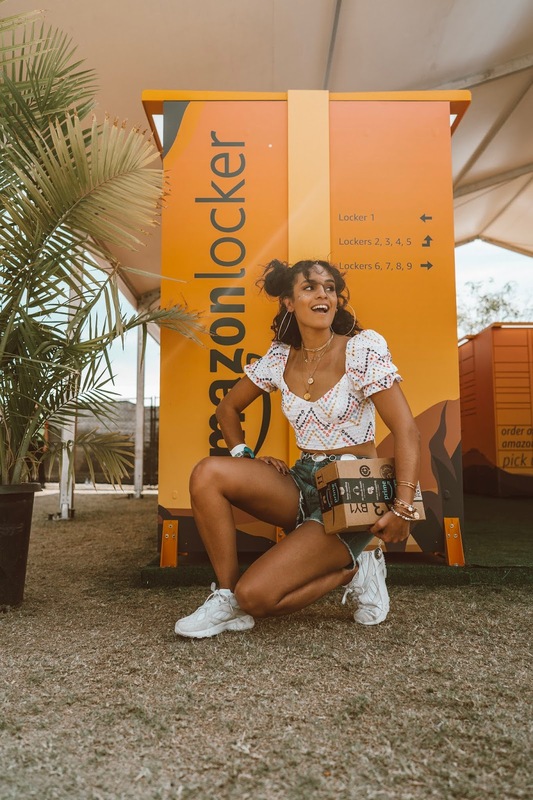 I was so bummed at first, but then I remembered there were Amazon Lockers onsite. 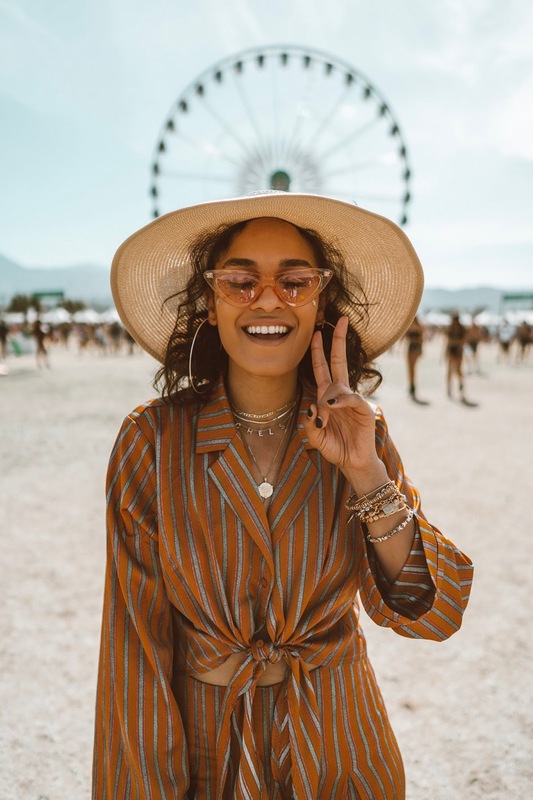 Meaning you can order just about any and every festival essential straight to the Coachella grounds! 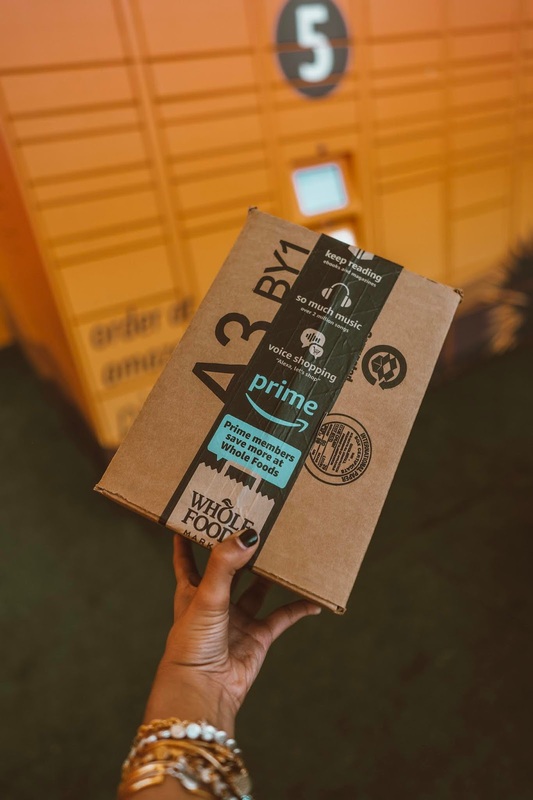 Plus, if you order before noon PT, you can get same-day delivery and pick up your items that same night. Umm...can we have these at all festivals?! For weekend two, you can order starting Thursday, all the way up until Sunday and pick up same day. I shipped myself my Polaroid film (of course! ), a water-proof case because you never know, and a sun visor - which came in handy for day three since the sun was borderline dangerous. 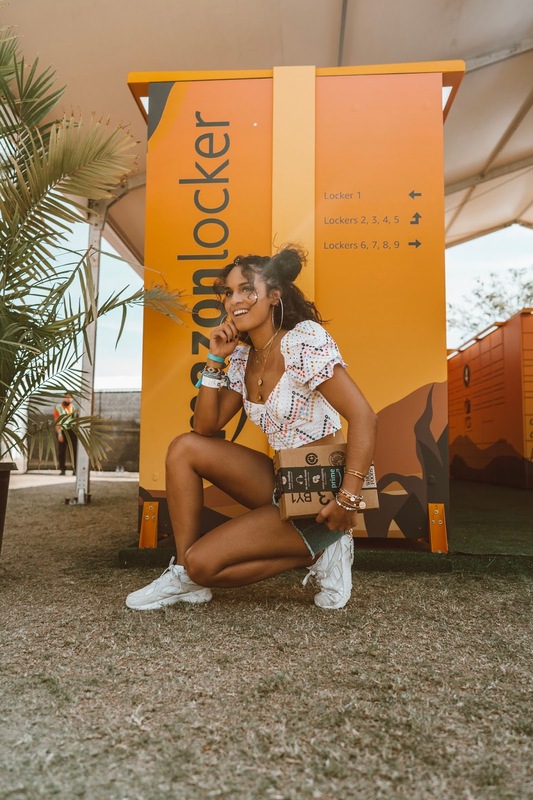 You can see the full selection here and at amazon.com/coachella! What are some of your festival essentials? 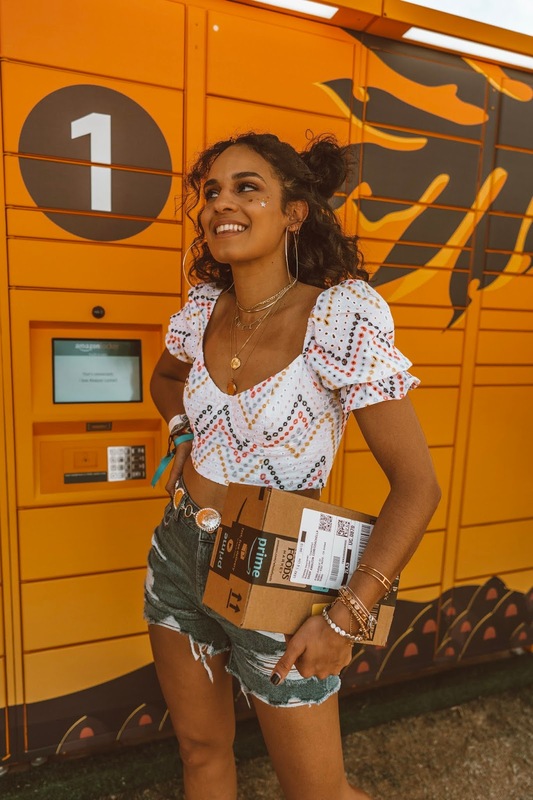 This post is sponsored by Amazon Locker. All opinions are my own! Hi cuties! 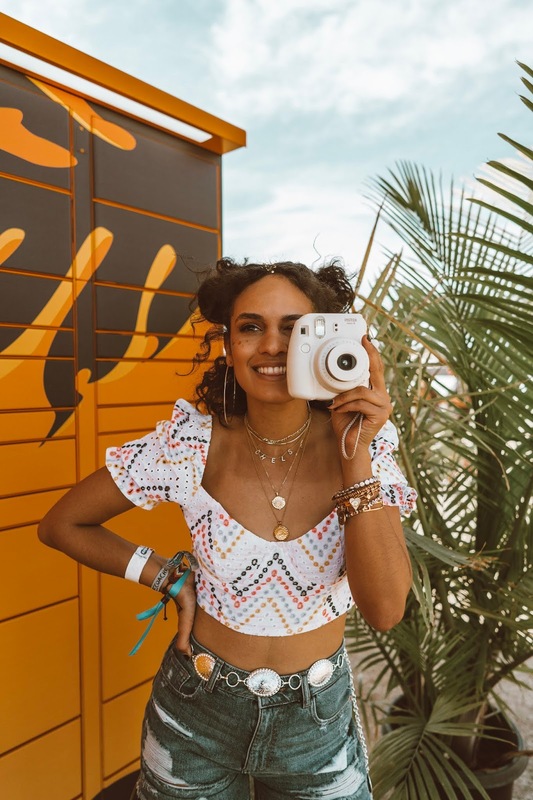 As you may have seen if you follow along on Insta - I attended my very first Coachella music festival this past weekend! 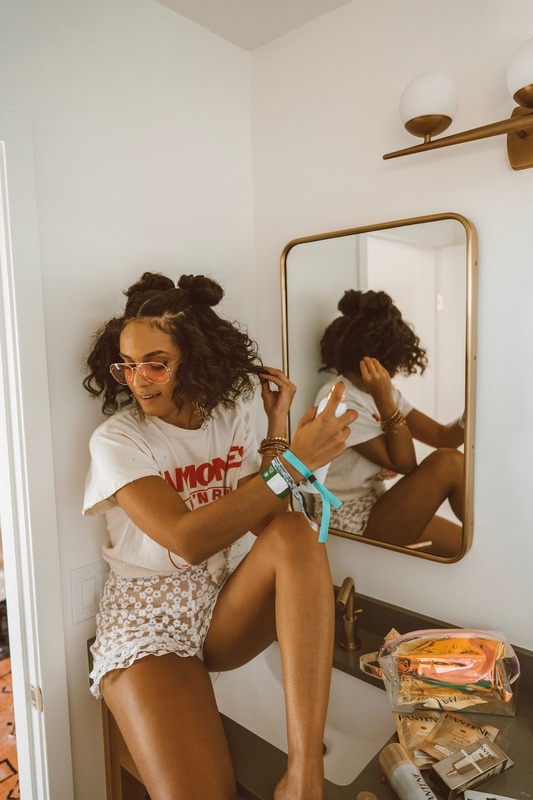 I’m working on a full blog post sharing my experience/outfits, but today I want to talk to you guys about a very important piece of this festival: hair! 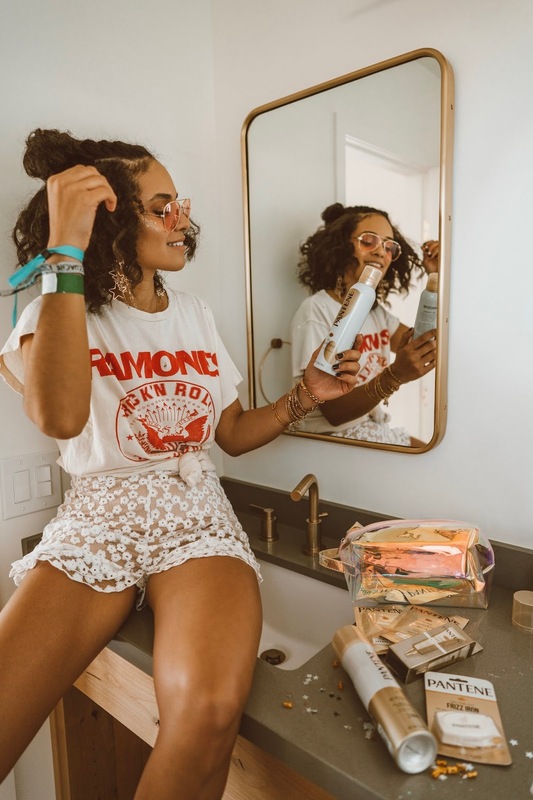 And not just the glitter-filled, space-like, boho-flow hairstyles that are signature to this event, but the actual care of your hair that is essential to surviving Coachella. 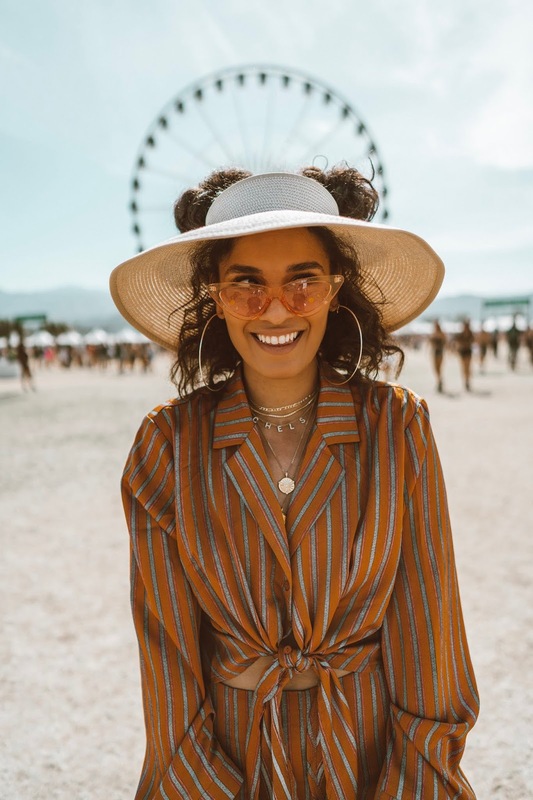 Think about it: you’re spending three full days in or around the desert dust, under the blazing sun, and to top it all off, constantly adding product and/or accessories to achieve those festival vibes. The possibilities for damage are endless! This is why it’s so important to take proper care of your hair pre, during and post festival season. 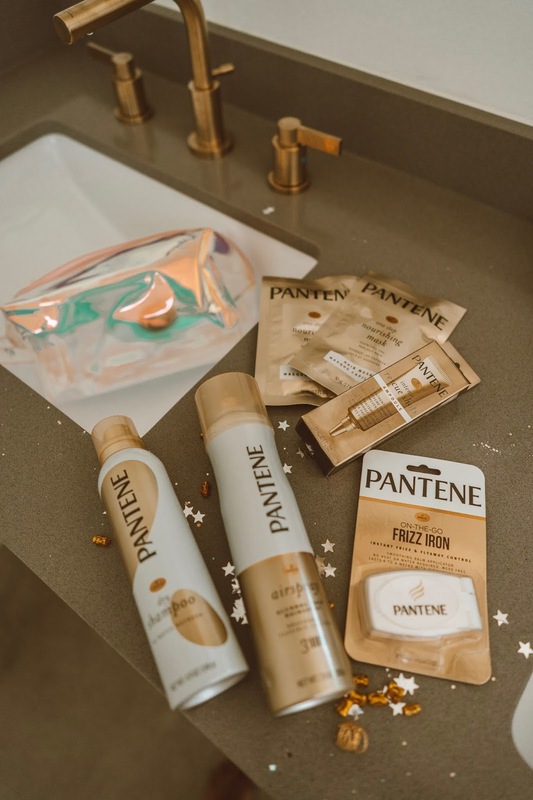 My secret weapon this past weekend was Pantene’s limited-edition Festival Hair Kit: a portable haircare pack with all of the essentials you’ll need to survive any festival you attend this year. 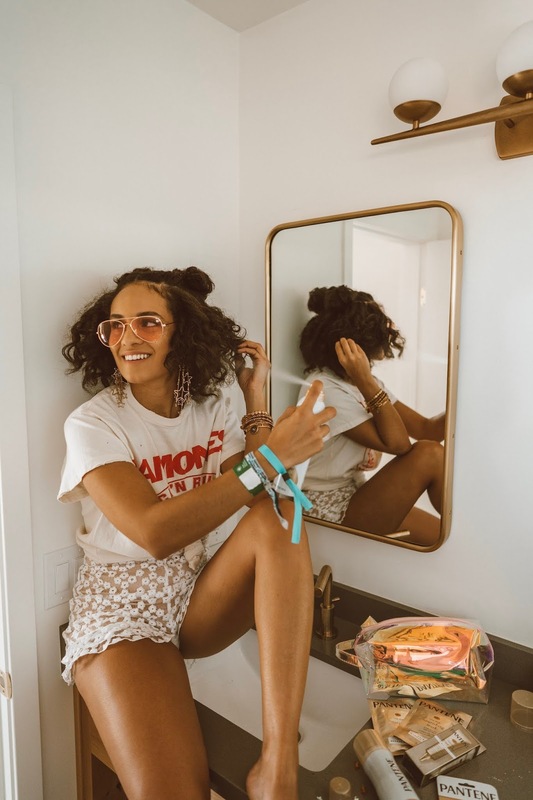 As the official haircare sponsor of Coachella, Stagecoach and Firefly, Pantene has got you covered with all your hair needs. 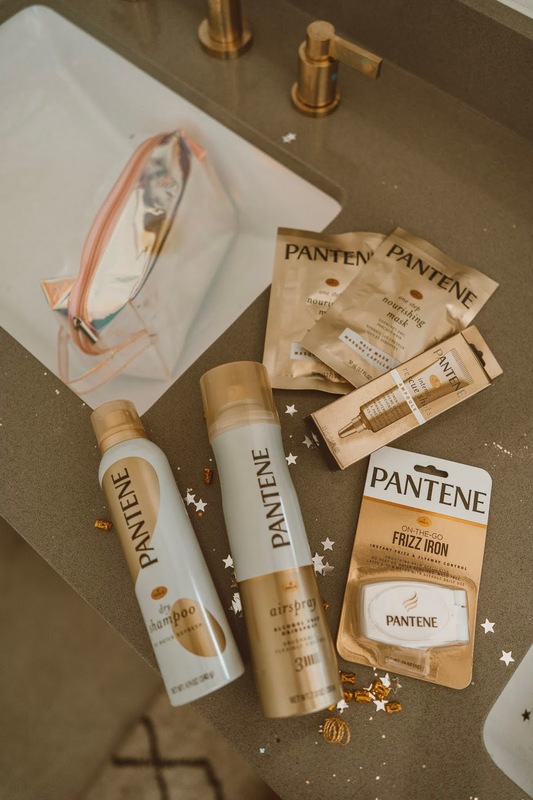 The kit is packed with Pantene’s Airspray, Dry Shampoo, two Nourishing Hair Mask sachets, one ampoule of the Intense Rescue Shots and the On-the-Go Frizz Iron. I also used the Dry Shampoo to carry me in-between styles as I didn’t wash my hair throughout the festival - takes too long to dry! Just shake, spray and rub in at the roots or wherever your hair needs refreshment most. It instantly absorbed oil and refreshed my hair, especially on the second and third day! 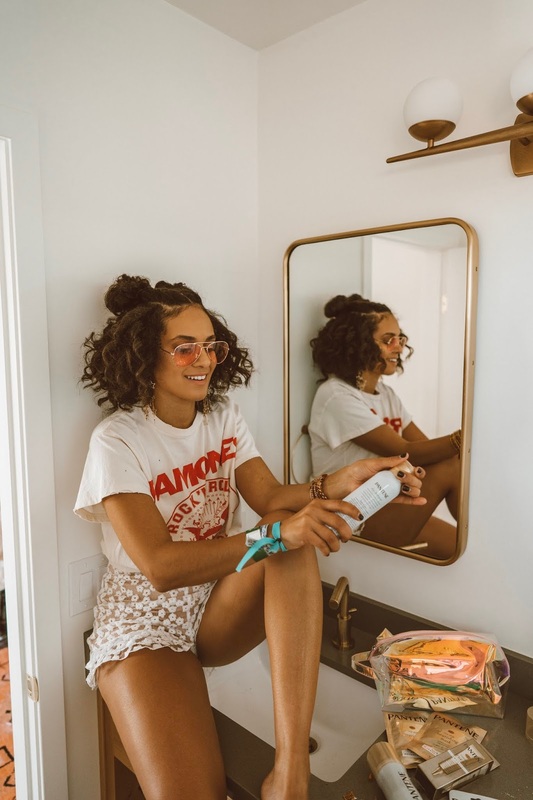 The On-the-Go Frizz Iron is small and portable and came in handy to fight frizz in the desert climate. It’s like a traditional flat iron, but without the heat! I’d close the Frizz Iron around my hair and glide it from top to bottom. Quick and easy way to straighten, smooth and moisturize my hair at the festival! I noticed my hair has been dryer than ever - all that sun/dust and no moisture will do that to ya! The Nourishing Hair Mask sachets and Intense Rescue Shots have been my saving grace since coming home! 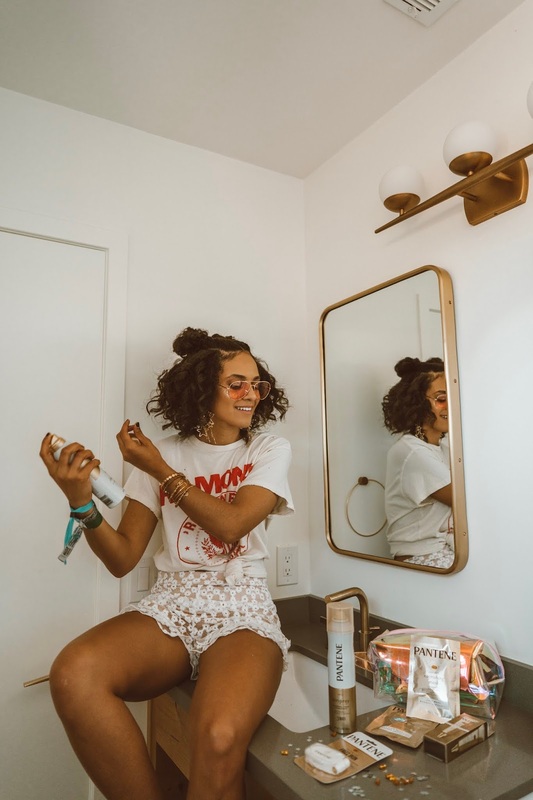 While in the shower, and after shampooing, place a half dollar amount of the Nourishing Mask inside your hands and comb through hair from mid-shaft to ends. I left it on for 5-7 minutes, but you can leave it on for longer if you so desire! Talk about an instant hydration boost! The real hero though, is the new Pantene Intense Rescue Shots. . 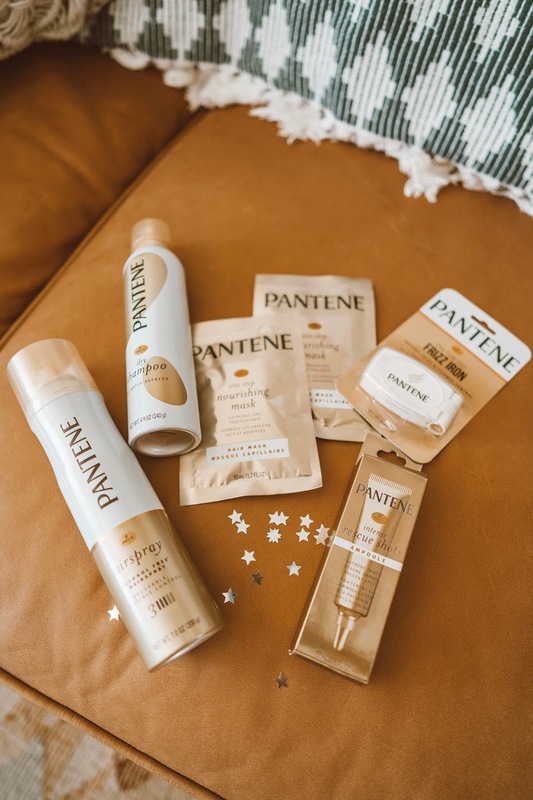 This is Pantene’s first at-home rescue treatment, imported from Brazil, and is currently the #1 selling NEW treatment across the haircare category. After washing my hair with shampoo, I applied the Intense Rescue Shots and massaged from root to tip, targeting areas that see the most damage. When you use it, be sure to leave in for 30 seconds, then rinse for 30 seconds. With these I was able to quickly repair damage to my hair from all the Coachella weekend fun! Also, I’d recommend using one of the masks pre-event to prep your hair as much as possible for what’s to come. I didn’t do this myself, but so will moving forward! 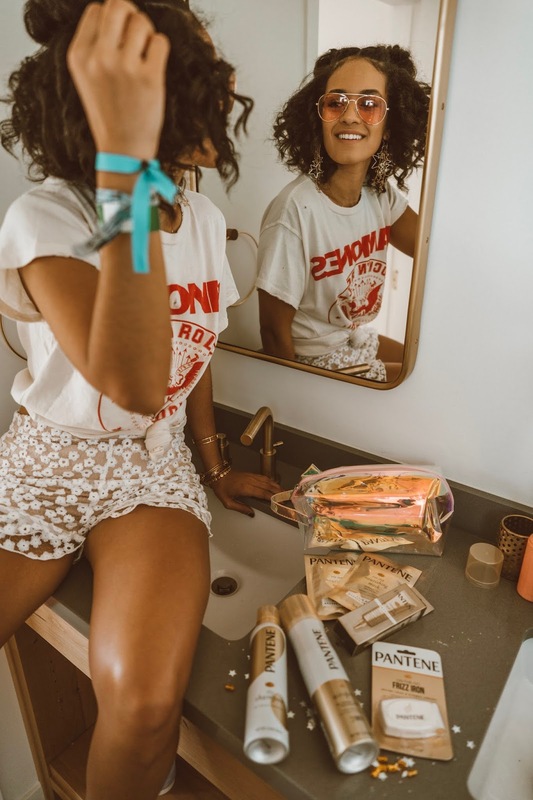 Get your own Festival Hair Kit delivered conveniently to your doorstep on Amazon. It’s also available for Prime Shipping! I’ll drop a few pics of the hairstyles I rocked this festival for some inspo below - let me know which one is your fave! 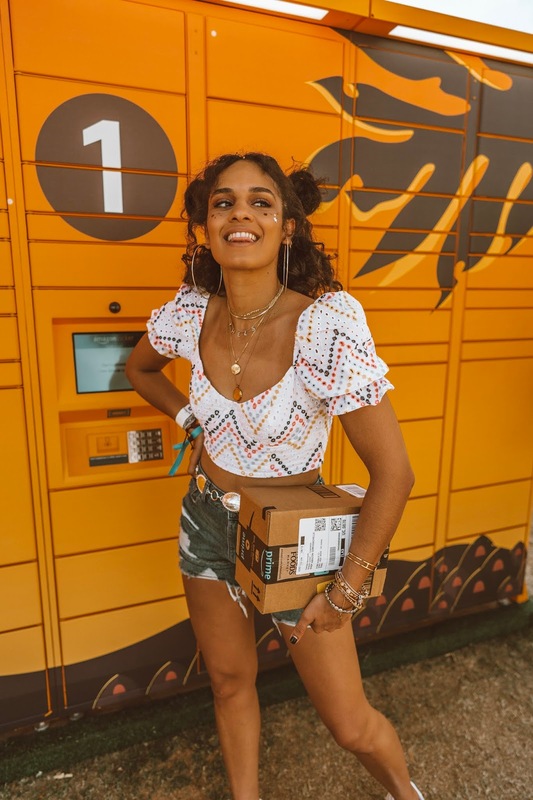 if you have any other tips for surviving festival season, drop ‘em in the comments. This post was written by me on behalf of Pantene. As always, all thoughts and opinions are my own. Hi babes - I'm finally back from all of the madness! The last few weeks have been insane with back to back travels to Hawaii and Palm Springs for Coachella. I've never been happier to be at home, in my PJs, writing to you from my couch. Hi bbys! Checking in from Hawaii after traveling for 11+ hours with NO WIFI. Yep - you read that correctly. I swear, when the gate agent mouthed the words "there will be no wifi access on this plane" I nearly collapsed. I knew I was probably being overly dramatic, but, I had never done such a long, daytime flight with no internet access to keep me sane. And much to my surprise, I did pretty well until around hour eight - then I legit ran out of things to do and resorted to cleaning out *all* of my devices. But, we made it fam! And what I really want to talk to you guys about today are my uber-comfortable travel sneakers: these high-top Vans from Shoes.com.